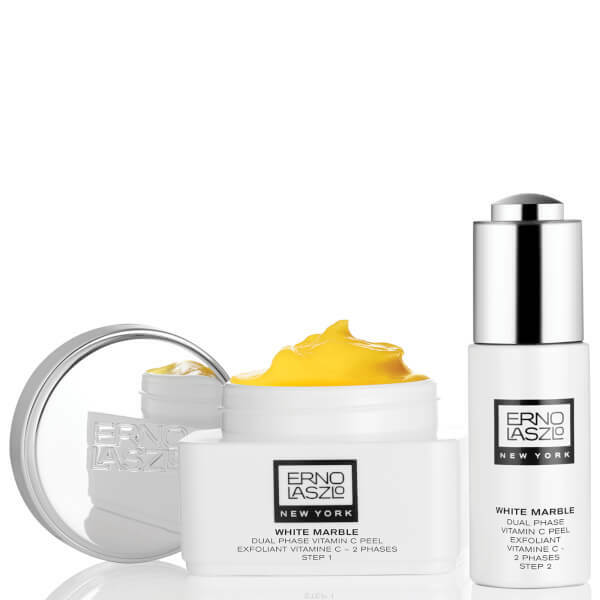 Polish and perfect the complexion with the Erno Laszlo White Marble Dual Phase Vitamin C Peel; a clarifying, two-step system that exfoliates and brightens the visage. Step one is enriched with Lactic Acid, which gently yet effectively exfoliates the face. The formula effortlessly smoothes over skin, and can be massaged in for up to three minutes. 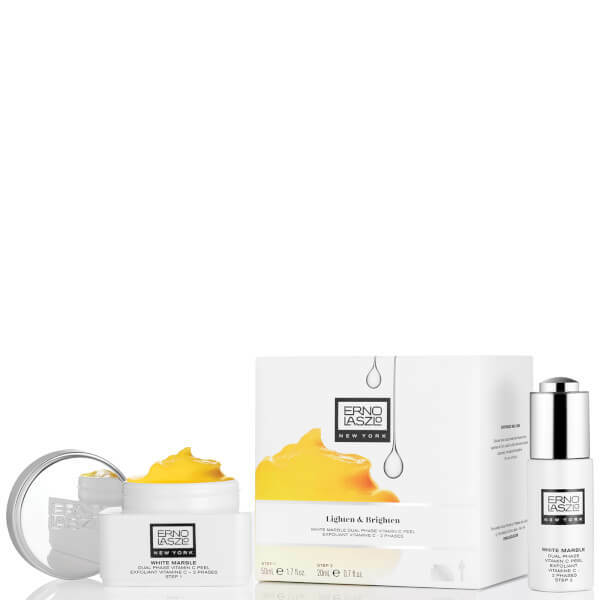 During the peel step, skin is polished, helping to reduce the appearance of dark spots and discolouration. The following treatment, step two, utilises an intelligent blend of brightening and moisturising actives. Simply mix the activator in hands and massage onto skin over the peel. Infused with Carrot Seed Oil and Vitamin C, the formula helps to balance dry skin, whilst transforming a dull complexion. Once rinsed away, skin appears bright, even-toned and illuminated. Free from phthalates, parabens, petrolatum, sulphates and mineral oil. Smooth peel (Step 1) over your face (avoiding eye areas) and massage gently for up to three minutes. Mix the activator (Step 2) in your hands and massage onto your face over the peel. After one minute, rinse well with warm water. Use weekly as part of your White Marble cleansing ritual. Peel: PEG-8, Sodium Bicarbonate, Propylene Glycol, Glyceryl Stearate Se, Silica, Steareth-20, Polyethylene, Tocopheryl Acetate, Sodium Ascorbyl Phosphate, Helianthus Annuus (Sunflower) Seed Oil, Daucus Carota Sativa (Carrot) Seed Oil, Daucus Carota Sativa (Carrot) Root Extract, Parfum (Fragrance), Limonene, CI 40800 (Beta Carotene). Activator: Water (Aqua/Eau), Linoleamidopropyl Pg-Dimonium Chloride Phosphate, Polyquaternium-10, Hydroxyethylcellulose, Sodium Ascorbyl Phosphate, Polysorbate 20, PEG-40 Hydrogenated Castor Oil, Trideceth-9, Sodium Hydroxide, Disodium Edta, Lactic Acid, Parfum (Fragrance), Potassium Sorbate, Phenoxyethanol, Sodium Dehydroacetate, Limonene.